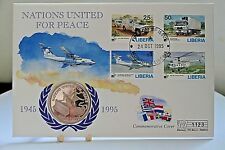 Westminster Liberia $1 Coin & Commemorative Cover ~ Nations United For Peace. Republic Of Liberia Coin. Nations United For Peace. All in mint condition, all with boxes where applicable and with leaflets. Listed now and more very soon. Number 1123. Westminster Barbados $5 Coin & Commemorative Cover ~ Nations United For Peace. Barbados Coin. Nations United For Peace. All in mint condition, all with boxes where applicable and with leaflets. Listed now and more very soon. Number 3585. G.B. 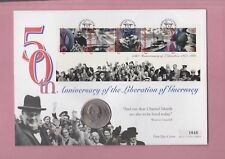 Coin Cover 1995, 50th anniversary of the liberation of Guernsey crown. G.B. Coin Cover 1995, V.J. Day, 50th anniversary, £2 coin. Coin Cover 1995, V.E. Day, 50th anniversary, 5 crown coin. Turks & Caicos.. Coin Cover 1995, V.E. Day, 50th anniversary, 5 crown coin. Turks & Caicos. CHELSEA SPECIAL. 2006 VICTORIA CROSS SET. THE VICTORIA CROSS. OF 6 SG2659/2664 ON. The supermarine Spitfire by R.J. Mitchell. Royal mint. Issu ed 5th October 1999. 2007 LEST WE FORGET. SHEET SGMS2796. 2ND ISSUE MINIATURE. G.B. Coin Cover 1995, V.E. Day, 50th anniversary, £2 coin. G.B. Medal First day cover 1999, The Great War, 1914 star. The 1914 star. No.0129 of 1000. 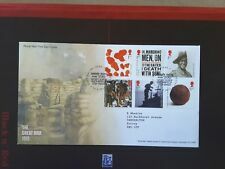 Benham cover, Folkestone, Kent. 2006 VICTORIA CROSS SET. THE VICTORIA CROSS. OF 6 SG2659/2664 ON. Hence the reason why we show 3 very similar Scans of the Cover. Our Ref:C122. G.B. Coin Cover 1995, 50th anniversary of the liberation of Jersey, £2 coin. The Battle of Britain, 60th Anniversary, Benham cover, Folkestone, Kent. Hence the reason why we show 3 very similar Scans of the Cover. Our Ref:C104. 2469 1971 General Anniversaries British Forces FDC "FIELD POST OFFICE 986"
2469 1972 British Polar Explorers - British Forces FDC "FORCES POST OFFICE 62"